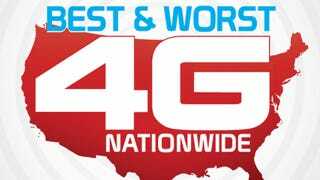 Nationwide 4G Showdown: Who's Fastest? With so many competing 4G technologies, it's easy to feel overwhelmed. That's why LAPTOP extensively tested the four major carriers in five cities nationwide—using phones, USB modems, and mobile hotspots—to determine which networks truly deliver on 4G's promise. We conducted 4G testing in Atlanta, Chicago, New York City, Orlando, and San Francisco. In three locations within each city, every product was tested to find out how quickly it loaded websites, and how fast it uploaded and downloaded files (using both real-world and synthetic tests). In each location, all tests for each carrier were performed during one sitting. We used Speedtest.net for our synthetic upload and download tests. We averaged 10 test results for each device in each location. To get real-world benchmarks, we downloaded a 155MB file (OpenOffice.org) from our FTP server. We also uploaded a 6.7MB Handbrake file to the same FTP. If it took more than 7 minutes to perform either of these tasks, it was counted as a failed attempt. As you can see from the above results (click charts to embiggen), Verizon Wireless' 4G LTE network crushed the competition in the Speedtest.net app, a synthetic test that measures throughput. In our five cities nationwide across three devices Verizon averaged 12.3 Mbps down and 4.7 Mbps. T-Mobile turned in a solid 4.7 Mbps average download, but that's 2.6X less than Verizon. Verizon's lead wasn't nearly as pronounced in our large file download and upload tests. When pulling down a 155MB file from an FTP server, Verizon averaged 4.4 Mbps. That's 1.35 Mbps better than second-place T-Mobile. We also uploaded a 6.7 Mbps file to the same server, and Verizon finished 670 Kbps ahead of T-Mobile. Sprint and AT&T weren't even close. A few seconds here and there doesn't sound like a lot, but over the life of your device it definitely adds up. Verizon Wireless once again proved fastest in our Site Load Time test, averaging 10.18 seconds when loading popular sites on a 4G LTE phone and on a laptop connected to a 4G hotspot and with a 4G modem attached. T-Mobile turned in a good 12.59 seconds, followed by Sprint and AT&T. There's a reason why AT&T and (presumably) Sprint are moving to LTE. It's a superior technology. As a result, Verizon Wireless' 4G network consistently delivered better speeds than the other big three national carriers in our testing. We'd like to see less dropped connections and smoother 3G-4G hands-offs from Verizon's devices, but overall the provider offered much faster speeds. Although you'll pay more for Verizon's 4G phones versus competing carriers, to us the speed boost is worth the premium. If you're looking for a good 4G deal, consider buying a smartphone, connection card, or hotspot from T-Mobile. You'll pay $20 less per month versus Verizon for a phone, and you'll get very good speeds in more locations. Sprint's solid 4G download speeds earned it a third-place finish. While we appreciate the carrier's unlimited plans, the network wasn't very reliable. Not suprisingly, AT&T brought up the rear,because the carrier simply doesn't offer 4G speeds in many markets yet.